I'm a huge Swervedriver fan. I saw the band several times during their heyday and when the band went on hiatus in 1999 without having reached a mainstream commercial audience I was pretty disappointed. Adam Franklin has released several albums under the solo alias Toshack Highway and performed select Swervedriver songs on tours. In June 2007, Franklin released his first album under his own name called Bolts of Melody on Hi-Speed Soul Records. When I found out that Adam Franklin was put out his solo disc, I got it right away. He came on tour and I saw him at the Cafe Du Nord - a GREAT show. Then Swervedriver got back together and I saw them at the Fillmore - another GREAT show. So last night was the trifecta with Adam touring with Magnetic Morning (a band he has with Interpol drummer Sam Fogarino). Their EP is wonderful (worth buying) and so I was pretty excited about seeing Adam Franklin perform again. This would be three times in one year! 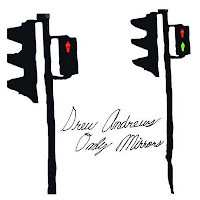 "There is magic with "Only Mirrors" - the atmospheric and absorbing debut solo album by Drew Andrews, guitarist from The Album Leaf. A rich dreamlike state beyond the gentle intricate guitars and Drew's feathery soft vocals. Maybe the abundance of feeling is from recording an album once again with a father who most of his life never knew he had a son. "Only Mirrors" lyrics reflect the tale of Drew's adoption and upbringing, the discovery of his birth parents at age 18, the meeting for the first time of his musician/producer/engineer father, Sven-Erik Seaholm, and his youthful foray into religious life, an intellectual journey which at age 20 improbably pushed and prodded him away from religion and into rock and roll full time. While better known for his active and current touring involvement for the last five years with the internationally acclaimed Sub Pop Records band, The Album Leaf; his band Via Satellite, the San Diego-based electronica/rock trio has also won numerous awards for their music. The roots of "Only Mirrors" lay within a Fall 2005 Via Satellite tour, when the band's van was busted into late one night in Lower East Side Manhattan, resulting in thousands of dollars of equipment being stolen." Then Magnetic Morning came on. I never realized how good of a drummer Sam Fogarino is. His drumming was heavy and hypnotic. I was in awe during the whole set. Magnetic Morning is a super group (of sorts) with Adam Franklin (Swervedriver), Sam Fogarino (Interpol), and Jimmy Lavalle (the Album Leaf). Sam and Adam met through mutual friend Jack Rabid (founder and writer of the Big Takeover) and instantly hit it off. Originally the was named Setting Suns but they later changed their name to Magnetic Morning because another band already possessed the Setting Suns name. The set felt like something out of a movie - a soundtrack of open roads and lots of space - I felt like I was floating at times, but Sam's beats kept my head nodding. The vocals are signature Adam Franklin dreamlike laze and the backing vocals were quite nice. F.A. Blasco was amazing on guitar (and seemed to be enjoying himself) and Josh Stoddard was solid on bass. Both added those nice backing vocals. After the show I said "hello" to Adam (as I did at the Cafe Du Nord show), mentioned that this was the third time seeing him this year and was happy that he's been coming to the Bay Area so much. He said it is sort of like a bus - when you want it to come it never does - and then all of a sudden three come by. I bought their new "A.M." disc. Spent the day listening to it (worth buying). "Magnetic Morning (formerly known as The Setting Suns) is an indie rock duo made up of Swervedriver singer/guitarist Adam Franklin and Interpol drummer Sam Fogarino. The duo met early 2006 over dinner in NYC, while being introduced by long term, mutual friend, Jack Rabid. The band was formed in winter of 2006-2007 in New York City. Their self-titled six-song debut EP was released on iTunes on November 17, 2007. A 5-track physical release of the disc will be officially released on DH Records on April 19th 2008. Magnetic Morning will release their debut album titled 'A.M' on 21st October 2008 via Friend or Faux, with a free download of the track 'At A Crossroads, Passive'. Adam and Sam are also set to tour the US through October to November 2008. The band was originally named "The Setting Suns", but decided to change their name "due to an already existing entity with a name too close for comfort". I've decided to post a few Halloween pictures over the next few weeks (some old and some new). I'll be offering up free MP3s as well, but not at the same pace as I did during October. I was surprised as I wandered about on Halloween and the day after how many stores had pulled their Halloween stuff without putting it on sale. Usually I purchase a decent amount of stuff pre-Halloween, but then go a bit nuts after Halloween. This year there wasn't much around to buy. It was a bit spooky. Prior to Halloween the stores started putting out their Christmas stuff. This year seemed earlier than usual. On Saturday I was out shopping with my wife, sister-in-law and son and it felt like Christmas was in full swing. Christmas decorations adorned nearly every store and you'd think you were in the middle of December (except there were few shoppers). What also surprised me this year was how few people decorated for Halloween. Neighborhoods were dark and those who did put something out really limited it to maybe a jack o'lantern and some spiderwebs. Our house had a total of seven trick-or-treaters - sad. I live on a court and the folks at the inlet didn't decorate. It took til you got nearly 1/2 way up the street until some folks put some stuff out. Our house is at the end of the court and up on a hill. You could see the ghosts from fairly far away, but for TOTs it is all about quantity and our street was far from that. Ah well...next year with Halloween on a Saturday I've already decided to have a Halloween party. My daughter asked me about a plastic tombstone I have in the garage. I told her I use it as a mold to create plaster of paris tombstones. (See pic on previous post - that was one of my earlier stones). I'm going to clear out the front of my home (a.k.a. Jurassic Park) and really get this place spooked out. Hopefully it will draw enough attention so we can see some kids in the neighborhood again.